STEP 2: UPLOAD OF REQUIRED DOCUMENTS - All documents must be in English, documents in Hebrew or in French can not be accepted (as the jury panel includes French and Israeli experts, the whole selection process is done in English). 2 reference letters : The reference letters will be uploaded by your referees, we suggest you to send them the following link that explains clearly how to proceed http://www.france-israel-fellows.com/?q=reference-letter-process Please pay attention that the reference letters should not come from your French hosting institution ! All documents must be in English, documents in Hebrew or in French can not be accepted (as the jury panel includes French and Israeli experts, the whole selection process is done in English). PLEASE PAY ATTENTION THAT YOUR APPLICATION IS NOT COMPLETE UNTIL YOU HAVE COMPLETED THE BOTH STEPS, ONLY THEN YOU WILL BE ABLE TO SUBMIT! 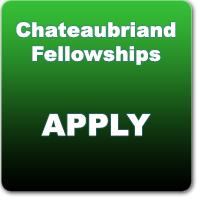 Provided you are eligible to candidate to Chateaubriand fellowship, here are its 3 main milestones dates. 1st date: The deadline for applying is on February the 28st 2019. 3rd date: October the 1st 2019 for travelling to France and beginning the fellowships for PhD students.